We have re-introduced the "Featured CD" that appears at the top of the screen - similar to PEv2. The Featured CD will appear at the top of every screen, next to the Progressive Ears logo. Hover your mouse over the picture of the album cover to see the artist and album name. 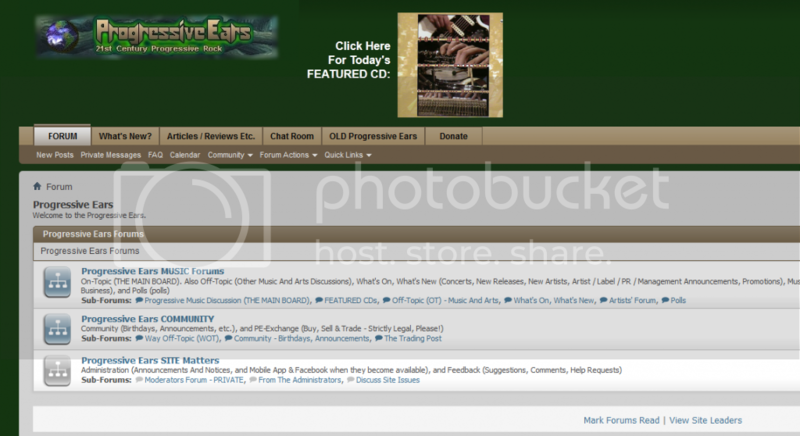 Click on the album cover or the "Featured CD" message to go straight to the Featured CD thread. You WILL NOT SEE the featured CD image if you are running Adblock, or any of the other ad blocking or ad filtering tools. That's great! Thanks, Duncan. The Featured CD at the top of the page was one of two things I missed from the old place. The other being the spinning globe. If you're running one of these tools and can't see the featured CD, you will have to instruct it to allow advertisements on www.progressiveears.org. If you're using Adblock, it's very easy: click on the Adblock icon (or look for Adblock in the tools menu) and then click on "disable on progressiveears.org"
How to disable AddBlock by addin an exceptions filter for progressive ears. Then check on Tools-AddBlock Preferences "Disable Progressive Ears". You WILL NOT SEE the presented CD picture if you are operating Adblock, or any of the other ad preventing or ad filtration resources. I use Adblock, and see it fine. You can instruct Adblock to allow that image. IE is almost mandatory at work? I think you need to find a new job! There are many browser-based business tools that are browser-specific. Several of my clients use (very sophisticated) tools that will only work with IE - or in one case, with Chrome. In addition - a lot of organizations will not permit the installation of software they have not provided, or vetted. Again, many of my clients provide either Chrome of IE, and downloads / installs / etc. are expressly disallowed.